Elasticsearch is an open-source, broadly-distributable, readily-scalable, enterprise-grade search engine. Accessible through an extensive and elaborate API, Elasticsearch can power extremely fast searches that support your data discovery applications. When running Elasticsearch it can be easy for costs to escalate when you consider the amount of processing and memory that is required for an Elasticsearch node. Let’s walk through how you can run your nodes safely on EC2 Spot instances using the Spotinst Elastigroup service. In this tutorial, I will set up an Elasticsearch 5.5 cluster consisting of a Master node and 3 fault tolerant Data nodes. 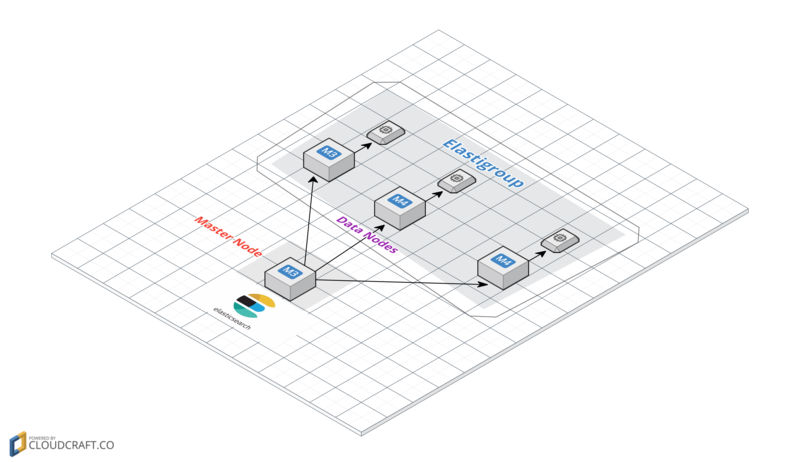 The Data Nodes are being set up using our cluster management service, Elastigroup. I have selected us-east-1 as the region for the tutorial. In your EC2 console spin up a new instance using the most recent Amazon Linux AMI and attach a role with AmazonEC2ReadOnlyAccess policy so that the script can get the Instance Metadata. sudo sh -c "echo 'ES_JAVA_OPTS=\"-Xms2g -Xmx2g\"' >> /etc/sysconfig/elasticsearch"
sudo sh -c "echo 'node.attr.rack_id: "$RACK"' >> /etc/elasticsearch/elasticsearch.yml"
Create a Security group that will allow TCP 9200 and TCP 9300 for internal traffic and SSH for external management. Note: Include internal traffic of all the AZ’s that you may select for Spot instances, later on in Elastigroup. Use cURL to make an API request to check the status of your new master. You should see a status of “green” as you can see below. Make note of the Private IP of the master you just created, the IP would be used later for creating our Elasticsearch Data nodes. Create an Amazon Linux AMI (same as the Master) and attach an EBS data volume (/dev/sdb). The User data script for data node is as shown below. This script will install Elasticsearch, mount your EBS data volume. Note: Be sure to update your userdata script and add the mkfs, mount and the /etc/fstab lines based on the volume you attach to the Data node. Create an Image of the Data node and note down the Image Id as this image will be used in Elastigroup.You can terminate this instance as we only need the Image of the Data node. The image has Elasticsearch 5.5 installed and data volumes mounted. Enter a name for your Elasticsearch Cluster and Choose the same region as the master node that you created earlier. In this example, I change the Spot Instance Percentage to 75% and set the Capacity to 3 for Target, Minimum & Maximum. Thus the Elastigroup will launch 2 Spot and 1 On Demand instance. On the Compute page, select the same Region, VPC as your master. In Compte tab under Additional Configurations, attach the same IAM role as attached to the Master. Note: Multi AZ’s makes the cluster fault tolerant but Latency and cost will be slightly more as data has to travel across AZ’s. Under Compute tab of Elastigroup in the Launch Specification, add the Image Id of the above data node. The instances launched from this image would have Elasticsearch installed and data volumes mounted automatically. Note: Be sure to update the Private IP of the master as noted above. sudo sh -c "echo 'discovery.zen.ping.unicast.hosts : [\"Private IP of the Master node\"]' >> /etc/elasticsearch/elasticsearch.yml"
It automatically re-attaches the data volumes to the new instances being spun up in case of Spot termination or failure of a Data node. Now that we have installed and configured everything let’s make sure Elasticsearch is up and running and our new nodes are healthy. Run the same API request as we did earlier to check the status of our cluster. You should now see three Data nodes and a Master node. This is done to delay the replica shard re-allocation by Master, for the node which is going to be spot terminated. The delay is so that the new node launched by the Elastigroup, would replace the terminated node and thus the new node can keep using the EBS data of the spot terminated node. Great, now that we have some documents, let’s check the number of shards again using check the health of cluster API call. We now have some data loaded and we have 5 primary shards and 5 replicas bringing the total count to 10 active shards, which is the default for an Index. Since we have three data nodes let’s add an additional replica for our “example” index via API. It is recommended that you have at least 2 replicas in such cases as the shards have sufficient backup and failure of nodes won’t bring down the cluster entirely. We now have a fully redundant Elasticsearch cluster running. 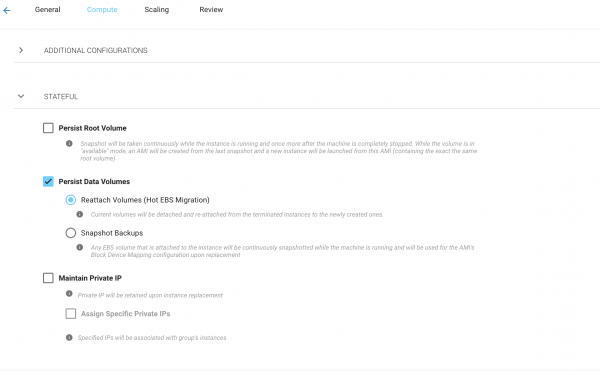 In case of any hardware failures or spot interruptions, the Elastigroup will automatically attach the existing EBS volume to the new instances. 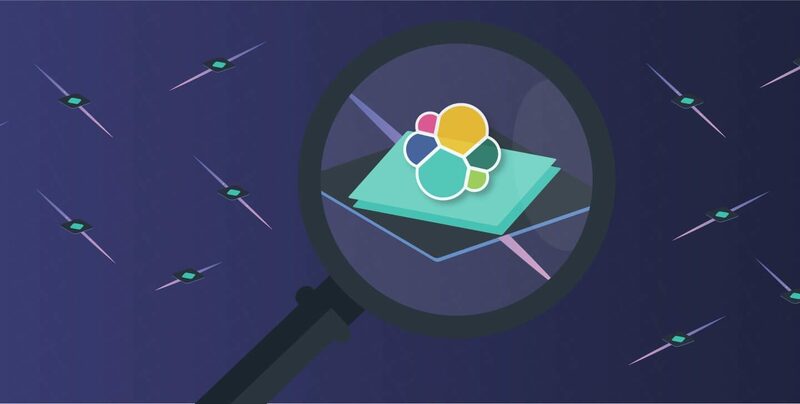 If Elasticsearch is aware of the physical configuration of your servers, it can ensure that the primary shard and its replica shards are spread across different physical servers, racks, or zones, to minimize the risk of losing all shard copies at the same time. In our case, we will need to define 2 logical racks: One will be the On-Demand and the other will be the Spot. If you look closely at the user data script you will see that we are using the AWS CLI (RACK) to determine this information. We are also updating the configuration elasticsearch.yml file on each server accordingly. When an instance is launched, our startup script is aware of the instance life-cycle (either Spot or On-Demand) and will assign the rack id accordingly. As shown above (When there was only a single replica) the node from On-demand rack with IP 172.31.50.160 has a shard copy and the node/nodes from Spot rack with IP 172.31.42.185/ 172.31.48.164 has a shard copy. Thus even if all of the nodes in the Spot rack get terminated or fail there is always a shard copy in the On-demand rack. Now let’s remove an instance from the cluster to simulate a spot interruption. Go into your Amazon Console and terminate a Spot instance. Now let’s wait for the replacement Spot instance to come live. The startup script that we defined in user data will configure the server automatically. Since we are using Persist Data Volumes, the data volume will automatically be attached to the new instance. Once the replacement instance is up and running, and the 10 minutes of delay allocation passes, we can query the API again to see the status of the cluster and shards. Now that the replacement spot instance is up and running, we can see that our Unassigned shard nodes are back up and running, thanks to our Persist Data Volume feature and the bootstrap configuration that we created in user data. Finally, you have a fault tolerant Elasticsearch cluster with considerable cost savings due to spot instances.